Why Crybaby Kant, not London Mayor Khan? Why sobbing for forgiveness in a smelly London loo? "Why all this stuff about alternate reality news?" Grumpus complains." We know it isn't Crybaby Kant, it's that horrible London mayor, Khan. We know he hasn't recanted. As for Jesus and Buddha, we know they have better things to do than visit him as he's sobbing in a smelly London loo, wracked with pain from kidney stones and guilt." "Why all this stuff about alternate reality news?" responds Alice, "Oh that's easy. Lots of people love news from places like Wonderland, which is just about my favorite place. And from Oz, where Dorothy keeps landing. And then there are places like Deep Space Nine. Some of us just naturally find ourselves in alternate realities. And other people are keen on news." "But Jesus and Buddha!!" grumps Grumpus, "Who knows what will happen next!!" "That sounds a lot like reality!" replies Alice. "A mayor not protecting citizens from violent crime, instead caring more about some feelings! Who would believe that if you made it up!" "Hmmmph," snorted Grumpus, then conceded, "You have a point." So what might happen next, to Crybaby Kant, still stuck in a smelly London loo, still wracked with pain from kidney stones and guilt because of the way his hate has hurt so many people, including nice Tommy Robinson? Alice wonders but does not know. She has never known, has never been the creator of a story. London Mayor Crybaby Kant Recants! Crybaby Kant Wails, Jesus Visits! 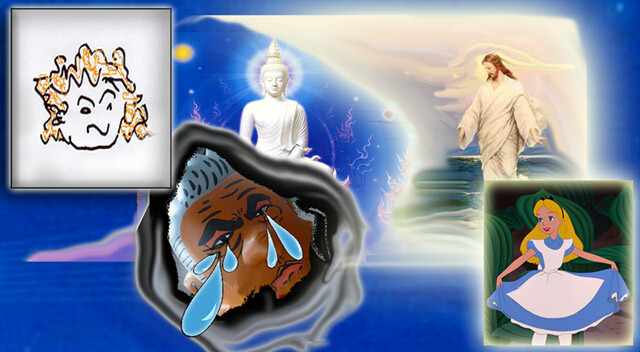 Buddha Appears to Crybaby Kant!